JACQUELINE LUQMAN: Hi. I’m Jacqueline Luqman with The Real News Network. 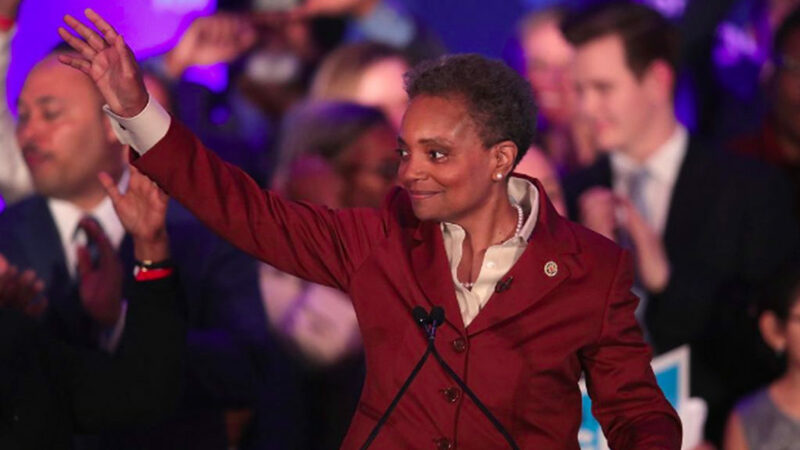 Lori Lightfoot has won the historic Chicago mayoral race, becoming the first African-American woman and first openly gay person to ever hold the office of mayor. Here she is in an interview this morning on MSNBC. SPEAKER: How are you going to deal with the violence that has plagued Chicago for so many years now? How are you going to deal with the checkered reputation of that police department? LORI LIGHTFOOT: I’m determined to make sure that we do what’s necessary to stem the violence. That means we’ve got to start investing in our people, investing in neighborhoods. Because a lot of the violence that we’re seeming is really crimes of poverty. SPEAKER: All eyes have been on Chicago in the last few weeks, as we watch the Jussie Smollett case play out. Mayor, should everyone involved in this case keep their job? LORI LIGHTFOOT: Well, look, first of all, we need to make sure that we recognize that hate crimes are real, sadly. They do happen. And regardless of what the circumstances are with Mr. Smollett, we can’t lose sight of the fact that people continue to be victimized just because of who they are or who they love. JACQUELINE LUQMAN: Here to talk about this is Micah Uetricht, an associate editor of Jacobin Magazine. He is the author of Strike for America: Chicago Teachers against their austerity. Micah, thank you so much for joining me. MICAH UETRICHT: Thanks for having me. JACQUELINE LUQMAN: So we just saw the clip of Lori Lightfoot’s interview on MSNBC where she specifically says that the first thing to do to address violence is to break the grip of poverty. And that point was completely ignored by the MSNBC host, who went on to talk about, of all things, Jussie Smollett. What does this say about the way corporate media sees the issue of poverty in connection to other so-called larger issues? MICAH UETRICHT: Well, the coverage of the Smollett case has been a very revealing look at how the corporate media treats all kinds of issues of misconduct in relation to policing. I have to think about the fact that I saw a headline the other day that showed that something like half a billion dollars in– billion with a B–have been paid out to people in Chicago for police brutality and misconduct cases over the past five or six years. And yet there is wall to wall coverage on a case like Jussie Smollett. Shows, of course, the media’s obsession with celebrity and the sort of gotcha moment that they think they have on this actor. And when Lightfoot makes a very sensible point that a huge issue in Chicago today is poverty, they immediately try to pivot away from it. But that point about the centrality of poverty and what has gone on in Chicago in recent years, as well as like many other American cities, is something that the media, the mainstream media, still is not as willing to talk as readily about. JACQUELINE LUQMAN: So when we’re talking about a so-called progressive candidate, because that’s how Lightfoot has described herself, and to be honest that’s how Preckwinkle, her challenger, also described herself, what chance does Lightfoot have in implementing these progressive policies, specifically this focus on attacking the crime of poverty as mayor of Chicago, when you have a corporate media that obviously ignores the issue? But also when she’s operating in the construct of the Chicago political machine, what’s the reality like that she’s facing to actually address that issue? MICAH UETRICHT: I think that the extent to which Lightfoot is talking about being a progressive is really a reflection not of her own personal political convictions, but of the strength of working class movements in this city. Like the Chicago Teachers Union, like the movement against police brutality in the wake of the Laquan McDonald shooting. Laquan McDonald was the 17-year-old black teenager who was shot 16 times by a white Chicago Police Department officer. So these movements have really set the agenda politically in Chicago over the last decade or so. And someone like Lightfoot, who really does not have much of a progressive record to speak of, feels the need to campaign in that rhetoric of being a progressive. So just that pure fact, that she feels the need to call herself that, shows that she can read the tea leaves of what Chicagoans are wanting in a mayor. And you can see that, of course, in the other election results from last night, which was that, for example, of the four democratic socialists who ran for the City Council, all four of them are currently in the lead of their races, and two of them won outright in the first round of elections in February. So that’s the most important thing about what has happened in Chicago in recent years, is the strength of that movement that has become a real–the other political pole. You know, people like Rahm Emanuel, the mayor on one side, the sort of neoliberal centrist corporate Democrat, and the working class movements on the other, and the candidates who have aligned with them. JACQUELINE LUQMAN: I’m glad you brought up the working class movement and the movement to address police corruption, because they they seem to play a large role in pushing Lightfoot to winning this office over Preckwinkle. Especially because Lightfoot seems to have received more corporate donations compared to Preckwinkle, and Preckwinkle received the support of the Chicago Teachers Union, which is a very powerful organization. So I’m wondering what was it, do you think, that pushed Lightfoot to win the office over Preckwinkle, who seemed to have the backing of a very strong working class organization, and Lightfoot, just by looking at the donors, didn’t seem to have that support. What was it that pushed Lightfoot over the edge? MICAH UETRICHT: I think there was a strong anti-machine, anti-corruption sentiment among the electorate, and Lightfoot was–excuse me, Preckwinkle was obviously portrayed as being of that machine, of the sort of politics as usual in the city, which is not totally wrong. She was the chair of the Cook County Board and a longtime political player, as opposed to Lightfoot, who has no elected experience; has done many things, but has not been an elected official in her career. And so she could portray herself–I mean, her campaign slogan was ‘Let the Light In.’ And that’s how she portrayed herself to voters who wanted something new in the city of Chicago. But just as on the national level we can see that that desire can play–you know, it can go wildly different ways. You can see an electorate who’s tired of business as usual opting for Bernie Sanders on the left, or you can see them opting for someone like Donald Trump on the right. That desire can go any kind of way. It could go towards electing democratic socialists to the city council. Or it can go toward electing somebody like Lightfoot as mayor, despite her not having the backing of a strong working class institutions like the Chicago Teachers Union, despite receiving large dark money donations, despite being opposed by many of the city’s black youth and criminal justice reform activists. So it’ll be interesting to see how those the diverging paths of that desire for change to business as usual plays out in Chicago in the years to come. JACQUELINE LUQMAN: And now to your point about the opposition to Lightfoot of Chicago’s black and youth and criminal justice advocates. Can you shed some more light onto what that opposition was about? Because we know that Lightfoot was involved in the Police Accountability Report that was released after the Laquan McDonald murder that exposed–well, it didn’t expose, but it it put on paper the culture of racism and abuse that’s existed in the Chicago PD, that’s been played out in black communities for decades. But what were police accountability and black organizations and community members opposed to Lightfoot in regard to this issue about? MICAH UETRICHT: Lightfoot’s record is truly mixed on this point. The report that you mentioned is incredibly scathing, if you read it. The language that it uses to describe the complete lack of trust among the city’s working class communities of color, and the perception that the police exist as a kind of occupying force that will brutalize them at random, whether or not they deserve it, that sent a strong message about what’s going on with Chicago’s police department. So we shouldn’t ignore that. On the other hand, there were cases that she oversaw like the disciplinary case of Dante Servin, the off-duty Chicago police officer who shot Rekia Boyd, a young black woman on the city’s South Side. And activists, you know–Servin faced relatively little punishment for killing this black young person in a very strange situation where she was shot by a stray bullet. The officer was sort of wildly shooting off. So there are cases like this that she’s overseen that have left black youth organizations in particular wanting to demand that she not be the mayor, given how she, in their perception, has seen that kind of black youth lives as largely expendable. So I think you’re going to hear a lot more about that from those organizations once Lightford takes office. JACQUELINE LUQMAN: Hmm. That’s very interesting, especially since Rekia Boyd’s name and a few other names of of black people, unarmed black people who were killed by the police, were actually mentioned in this report. And it’s interesting to hear that Lightfoot during her time overseeing these cases actually didn’t call for more punishment, in this particular case of Rekia Boyd. But the last point I want to ask you is about what you mentioned about the culture of corruption in Chicago politics, because quite a bit was made of of Preckwinkle’s ties to corruption scandals, from the nepotism scandals where companies that employed her son were awarded contracts, to the hiring of the son of the alderman who tried to extort campaign contributions for her from a restauranteur who wanted renovation permits–sounds like something right out of the Sopranos–to her dishonesty about how much she knew about sexual misconduct allegations against her chief of staff. Was the corruption, the ties to this kind of typical Chicago machine corruption, was this also a big help to Lightfoot, who just didn’t seem to have the reputation or the electoral experience that Preckwinkle had that might have pushed her to this win over Preckwinkle? MICAH UETRICHT: First, let me just say, I mentioned that Rekia Boyd was shot, I said, on the South Side. It was actually the West Side. My apologies for that. Got to get it correct for my Chicagoans out there. MICAH UETRICHT: You know, as I mentioned before, there is this anti-incumbent, anti-status quo mood among the electorate. And when you’re the president of the Cook County Board, whether or not, you know, I think there are some cases that are worth looking into about Preckwinkle’s ties to someone like Ed Burke, the alderman who you mentioned who shook down a Burger King owner to try to drum up some business for his law firm. You know, there are some things that are worth looking into, like that. There are other things, like the fact that her son worked for a construction company that got some contracts with the city that are are not worth–that really are kind of a non-story. But again, with the mood of the electorate, people want something different. I think just kind of the steady drumbeat of talk of her being a, you know, Chicago machine candidate, or her having these close ties to the city’s political class, that stuck. Again, because Lightfoot does not have that same kind of long track record of being in office she could say I am, you know, I’m a tabula rasa. I’m spotless. And you know, don’t pick the person who’s got all this corruption, pick me. Of course, what she doesn’t say is that she worked for years as a corporate lawyer and has got all this money from similar corporate lawyers, and you know, the city’s wealthy funding her campaign. But she was able to escape any kind of attacks on that front. And they also allowed her to occasionally get away with rhetoric that was very surprising. Like, for example, in the last few weeks of the election, she suggested moving the city’s police academies into closed schools around the city of Chicago. You know, if you remember, just a few years ago the city closed 50 schools, a move that was very much opposed by the Chicago Teachers Union, and it’s still very bitter in the minds of many Chicagoans. And separately, black youth activists and criminal justice activists have said don’t spend new money on this $95 million police academy that has been proposed. And Lightfoot said “I have the solution. Why don’t we move the police academies into the schools?” Are incredibly, she managed to offend two different movements all at once, killed two birds with one stone. It’s an amazing act. So it’s clear that she is just sort of totally disconnected from what the city’s working class movements have been doing over recent years. And again, I think we’re going to see quite a bit of friction between her and those movements once she takes office. JACQUELINE LUQMAN: Well, unfortunately we are out of time. We are absolutely going to have to keep our eye on how Mayor Lightfoot governs in a city where there are social movements that are demanding change, and we’re certainly going to have to watch to see how she does in responding to those people and the change they want. Thank you very much, Micah Utrecht from Jacobin Magazine, for coming to talk with me today about this issue. JACQUELINE LUQMAN: And thank you very much for watching. I am Jacqueline Luqman with The Real News Network in Baltimore.